Spring is a season of joy and fun, in our GOD Satsang too! Our Dallas GOD Satsang came together for a celebration during this season. When the celebration is about Lord Krishna and our Guru Maharaj, it is indeed nectarine – and hence it was ‘Madhura Utsav’. On Saturday April 23rd 2011, the Madhura Utsav started at with Prabodhanam. 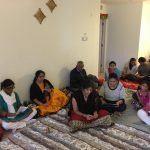 A satsang on Pancha Geetham was organized at the new “Rishi Valley” residence of Smt. Shyamala and Sri Lakshmanan of Dallas. In the presence Sri Swamiji’s Holy Padukas, the devotees chanted the Mahamantra and sang a few of Sri Swamiji’s kirtans. Then Sri Narayananji spoke on Guru Krupa which have led us all to ‘Rishi Valley’ (the name for this home was blessed by Sri Swamiji) and the significance of the name. 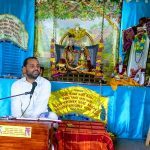 Following this, he gave an overview of the Pancha Githam along with a detailed exposition of the Venu Geetham playing each of the first three gitams from the “Pancha Geetham’ CD which devotees accompanied in the parayanam. 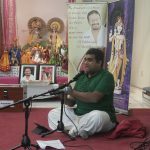 Sri Swamiji’s kirtans, like Kuzhalosai seigindran…, vandhadhu vandhadu vasantham, kannan engal mannavan, etc. were sung as the appropriate Krishna Leelas were expounded. Towards the end, Sri Narayananji spoke about how our Guru Maharaj had a special place for Texas in His heart and how He used to refer to the entire ‘Texas’ family right from the start! All the 50+ devotees enjoyed the 3-hour long satsang, which ended with prayers and Kaliyayum Bali Kollum. 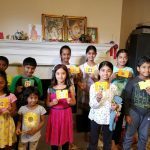 In the afternoon, all the Dallas Satsang kids (ranging from 3 years to 14 years) gave a 1-hour music performance with Sri Guruji’s kirtans as solo / group performances. It was amazing to see the enthusiasm of kids in learning and singing Sri Swamiji’s kirtans… Smt. Vidya Ramji and Smt. Booma trained the kids and organized this part of the program. Sri Swamiji’s ‘Blissful Blossoms’ book specially signed by Sri Ramuji was given as prasadam to all the kids that performed. In the evening, Sri Meyyappanji of the Dallas GOD satsang generously opened the doors of his school for the evening satsang. At 7pm a motivational quiz event (called Jeopardy) was conducted by Mrs. Uma Meyyappan based on the Mahabharata. After dinner, a Divya Nama Sankirtan was conducted with a mix of Sri Swamiji’s kirtans and Namavalis, led by Sri Sankarji and Sri Kalyanji. During the 2 hour Divya Nama Sankirtan, there was a huge storm with lightning and rains across the state. The day ended with dolotsav. The morning of Sunday April 24th was the gruhapravesh of the new home of Smt. Uma and Sri Meyyappanji. 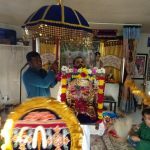 The routine gruhapravesham rituals were done early in the morning and by 7:30 am, the Holy Padukas of Sri Swamiji were welcomed into the new house by the hosts, marking the Paduka Pravesham with “Varuvaai Varuvaai Gurunaatha…” kirtan. Following this, Smt. Umaji and Sri Meyyappanji performed Puja to the holy padukas of Guru Maharaj with their own hands. 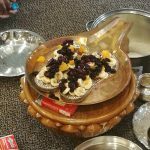 Kirtans of our Guru Maharaj were sung and after the Puja, on behalf of GOD, Sri Swamiji’s prasadam was given to Sri Meyyappanji. He also spoke of the glory of the Guru Padukas and narrated a few divine experiences of the divinity and sanctity that Sri Guruji’s Padukas bestowed where ever They went. After the talk, all the 60+ devotees gathered there performed prayers for the wellbeing, peace and prosperity of Meyyappanji’s family and for everyone.